Back in March Metropolia Business School‘s resident management expert Daryl Chapman visited our partner university, University of Hertfordshire for their Europe week and wrote the following report about the experience. This was my third visit to the annual Europe Week event at the University of Hertfordshire. As usual the event was very well organised and the invited European lecturers were well looked after. The format was different this year, as there was a wider use of tutorial sessions to support the main lectures. In total, I delivered three one hour tutorials to smaller groups of students who had all been present at my main lectures (audience approximately 100 students and staff). I was assisted with the tutorial arrangements by a UH staff member who also sat in on all the tutorial sessions. The sessions acted as a major support to the lecture content and allowed the students to think freely and express themselves in a more informal setting. I also promoted Metropolia business school during the week and several students seemed to gain an interest in studying in Finland as a result. 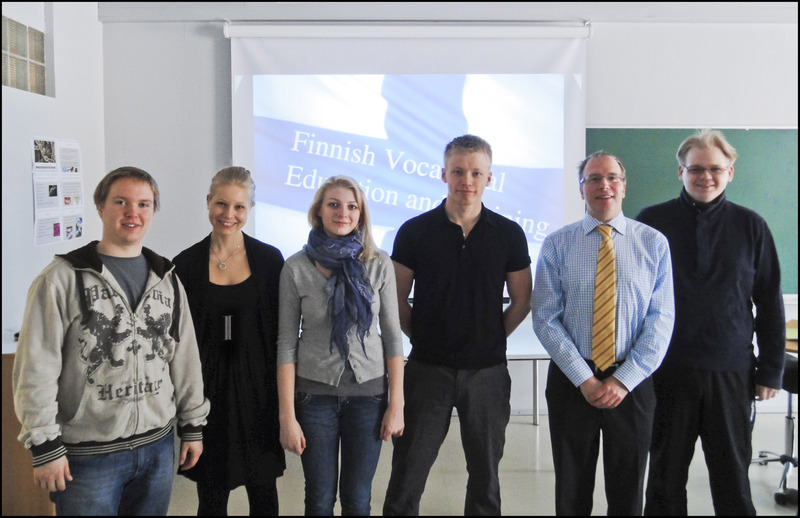 The topic area that I was asked to focus on was Finnish Vocational Education and Training. I was assisted by a Metropolia research team made up of five EBA09 students (Victoria Apasova, Dan Steinnes, Jenni Jokinen, Antti Pöyhönen and Jere Suikkila) who will be starting their studies at the University of Hertfordshire in September. The team did an excellent job with their background research and as a result my sessions in Hertfordshire went very well and I received excellent feedback from both staff and students. My overall impressions during my time at Hertfordshire were extremely positive. The University is a genuine vibrant community of people which together have been able to develop and foster a highly cohesive organisational culture. All of the visiting lecturers were made to feel very much at home and part of the community. Many visiting lecturers come back to Europe Week year after year because of their positive experience. The University is clearly very innovative in its approach to higher education and its achievements are being recognised at both National and European level. An example of this is its approach to entrepreneurship, which is seen as a key element in all teaching and learning. This approach has been recognised and rewarded at a national level, as the university was named as the most entrepreneurial university in the UK in 2010.